Despite its tiny, Atomic roots, this could become the centre of be one hell of a mighty little machine. Zotac shipped us one of the first of its all singing, all dancing mini-ITX Ion motherboards straight from Macau, China but in the emails preceding we have to say we weren't overly enthused. Around £159? EX VAT!? THAT'S CRAZY! These were just some of the words fired from our desks to Zotac. However, on receiving it we now understanding why. We're in the groove and getting what makes Zotac's 17cm square Intel Atom 330 (dual core) with Nvidia GeForce 9400 mGPU really quite the bundle to have. 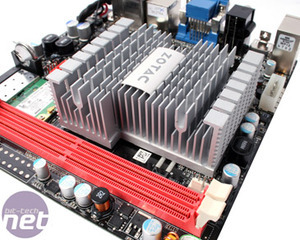 Because it's more than just a motherboard - it's a mini-ITX starter kit. In the box we get not only the motherboard and the usual smattering of cable extras, but also a 90W DC-DC power brick too! The respective power hardware is built right into the motherboard affording a potentially even smaller PC, where the inevitable optical drives and hard drives are powered from a Molex socket on the motherboard itself - that's somewhat ingenious to say the least, but we do question how much power this one socket can provide. We're not wanting to burn out an expensive board with three hard drives and a Blu-ray drive daisy chained off a single connector. 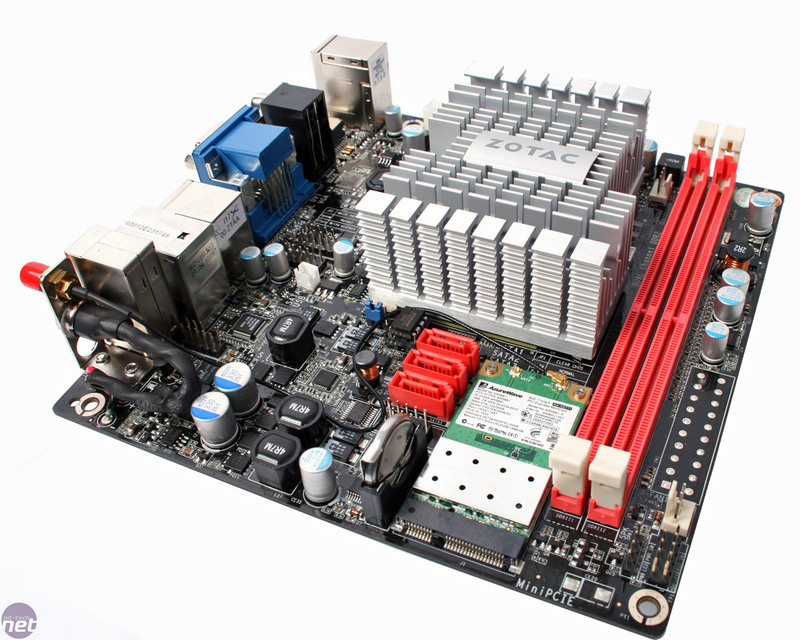 As you might be able to see in the pictures, this board is missing the ATX socket but there are boards that will ship with it, so if you're not needing the extra expense of this power hardware then there will be cheaper alternatives. Zotac has given us some price figures, but they are so outright ballpark (basically a bundle of estimates including $ rate, shipping, distributor margin, retailer margin and future component cost) that we don't think they're that relevant yet. The £159 (ex. VAT) we mentioned above is one of those figures, so take it with armfuls of salt that this will be the price you pay. Compared to the Acer AspireRevo; a whole PC that includes hard drive, memory, case and power: it seems positively crackers. 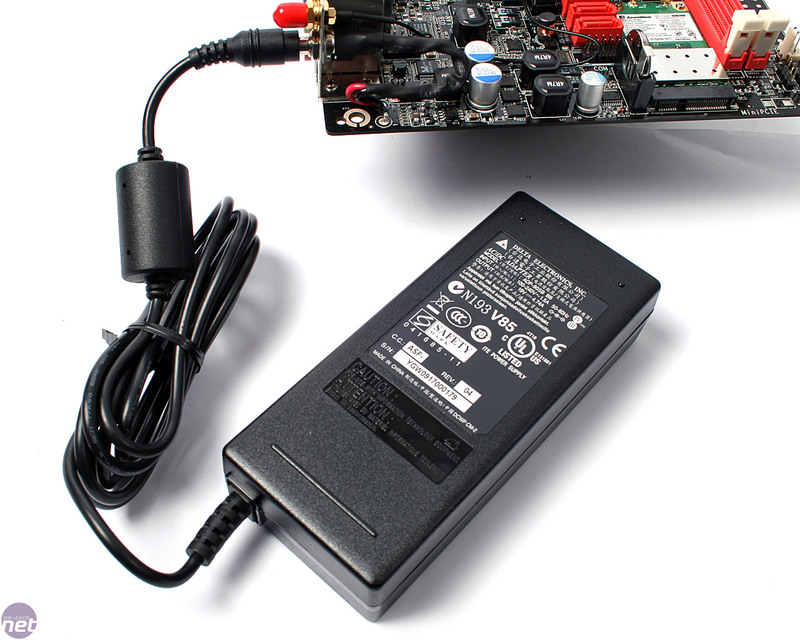 But price it up against any other very low power mini-ITX (with the same features), with CPU, cooler, and find a 90W power brick with DC-DC board too - and it's not quite so bad. 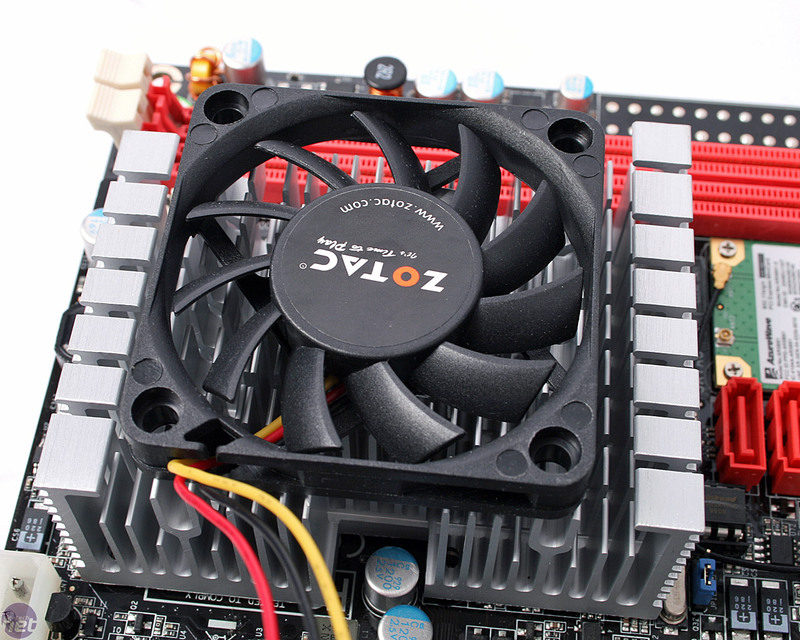 Zotac straps a very large aluminium heatsink to cool the 9400 mGPU and dual core Atom underneath - it's no taller than the rear I/O so it'll fit low profile cases, however it will still require some cooling, especially for hot little ovens cases. For this, Zotac throws in a slim 60 x 60 x 10mm fan to add extra cooling. Features include just three SATA 3Gbps ports, with another dedicated to eSATA, so we're missing a potential other two that the GeForce 9400 mGPU supports. It is a shame because this would make a great base for a homebrew NAS box although. A mini PCI-Express 802.11g WiFi module is included too and there's also the space for an extra antenna so it can be upgraded to "n" wireless as well (at your own cost). Two DDR2-800MHz DIMM slots afford dual channel memory - tonnes more bandwidth than the Intel 945GC, which only offers a single channel of DDR2-667MHz. This should also go a long way to leveraging the extra performance of the second Atom core that we have found is hugely constrained by the low FSB and meagre memory bandwidth of the Intel chipset. The final beta of Firefox 4 promises over 7,000 bug fixes since the last beta release.